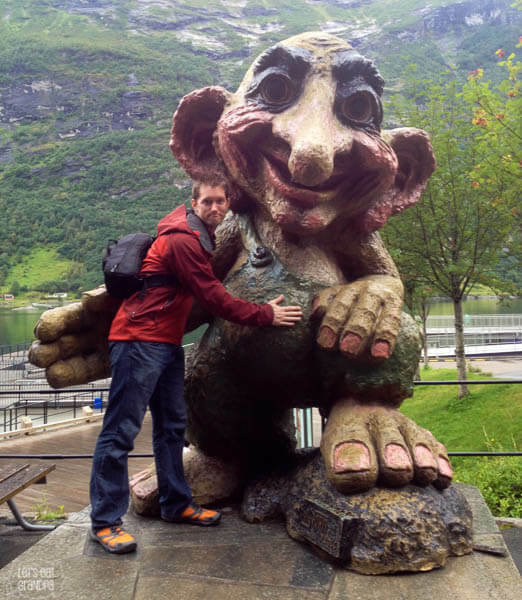 In the previous installment of our honeymoon travelogue: Cori and Ryan use a lot of adjectives to describe fjords. 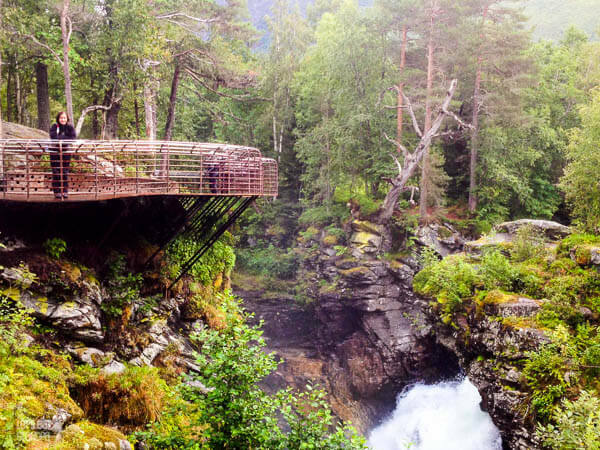 Be warned: by the end of this post, you may have booked your own trip to Norway without even realizing it. We woke up to a bright sunny morning in Kristiansund — the first bit of sun we’d really seen since we got on the motorcycle. The weather report said partly sunny, which we decided meant that it was certainly going to rain. If there was a chance the sun would shine for more than 30 seconds, Norway calls that “partly sunny.” It may rain 99.9% of the day, but if that sun comes out, they’re calling that partly sunny. Thankfully, we were wrong! We remained relatively dry all day (sprinkles, yes. But sprinkles ain’t nothing compared to our first couple days!). What a change! 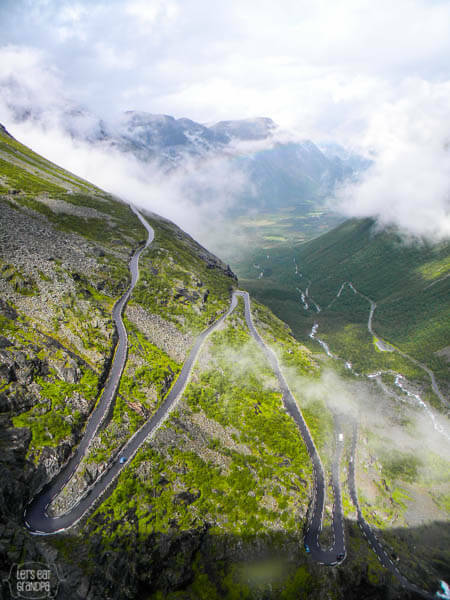 Ryan and I were both excited for our drive back down to Geiranger, via the Troll Ladder (Trollstigen) and Gudbrandsjuvet. 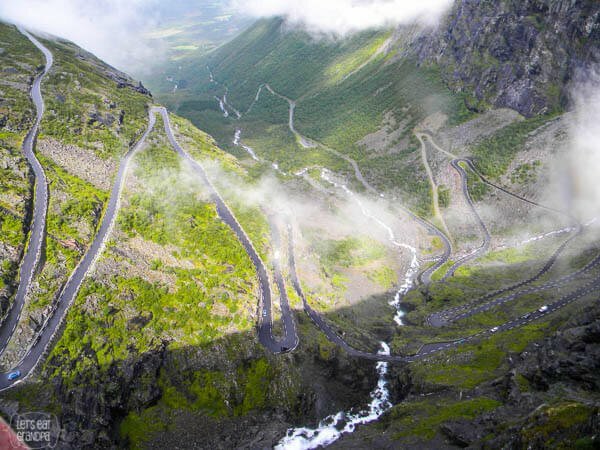 The Troll Ladder is a crazy road that climbs at a 9% grade for 11 hairpin turns. It’s gorgeous and terrifying at the same time. As we got up to the top of the mountain road, I started to feel a little dizzy. It’s impossible to comprehend the vastness of the landscape and my brain went into overload. But I had the GoPro camera strapped to my helmet, so Ryan’s advice was “close your eyes and pan!” Ha! 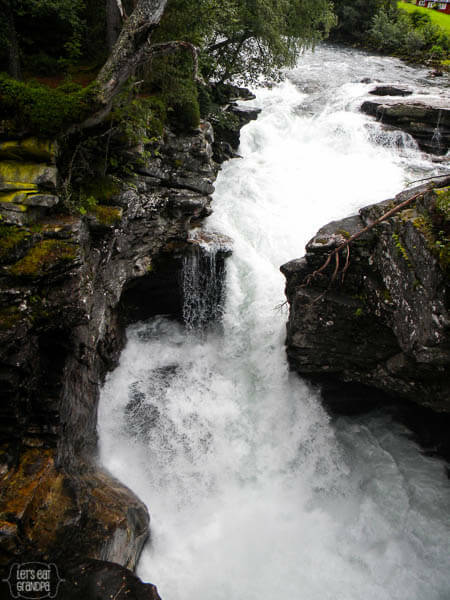 We got to the top and were surprised to find a beautiful lookout and rushing waterfall. The architecture of the visitor’s center was amazing, and they had re-routed the river through a series of stair-steps. There was a small restaurant and bunch of walkways that stretched out over the Troll Road. It was a little busy with tourists, but not too bad. As we walked out to the overlook, a cloud started to inch its way up the valley (you can see it in the above photo). 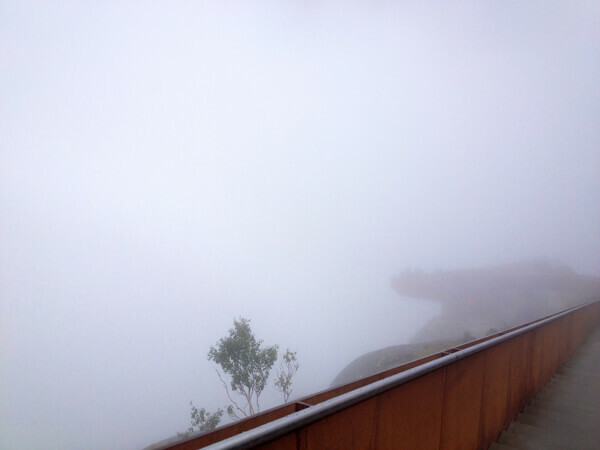 By the time we made it to the lookout, we were completely ensconced in the cloud and couldn’t see a foot in front of our faces! We were really disappointed, and decided to grab a coffee at the cafe and hope the cloud would retreat. Our patience was rewarded. 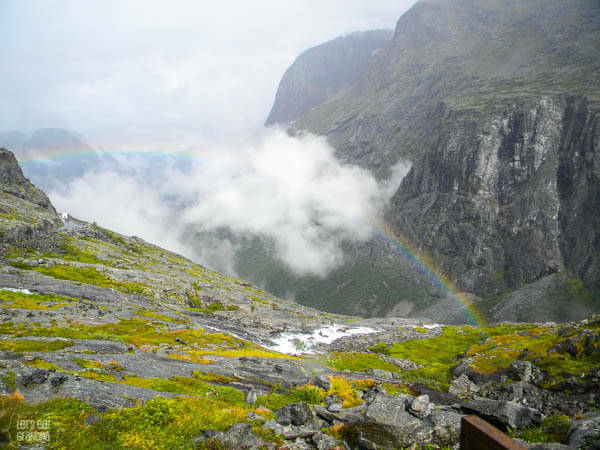 The cloud worked its way out of the valley and not only were we treated to an amazing view, but a bright rainbow over the waterfall! 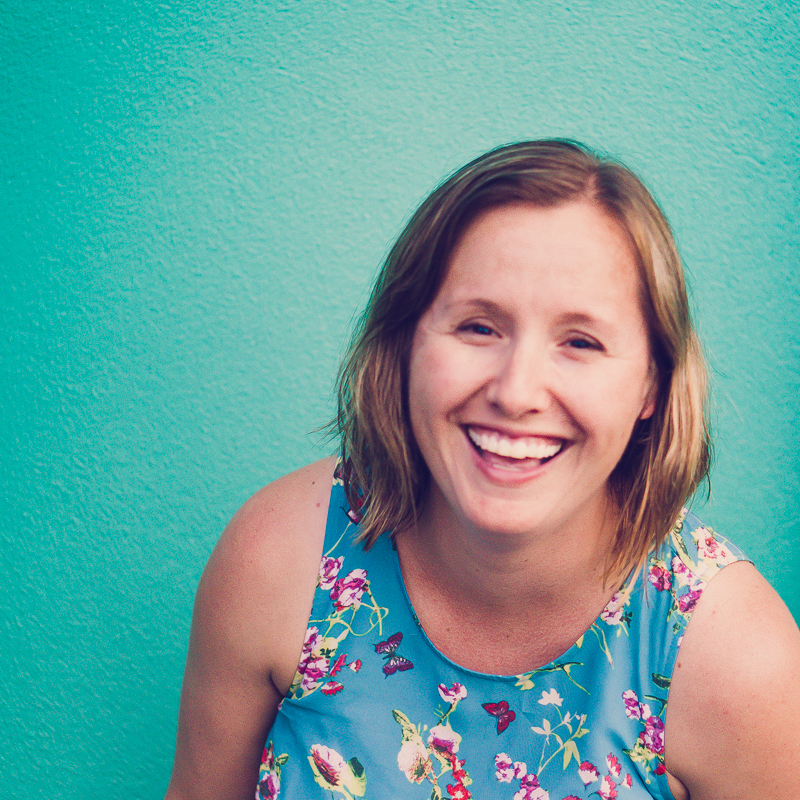 I was almost in tears — it was one of the most beautiful things I’ve ever seen. Out on the walkways, we had a great view of the road. It’s an incredible feat of engineering, and I feel blessed we got to experience it! 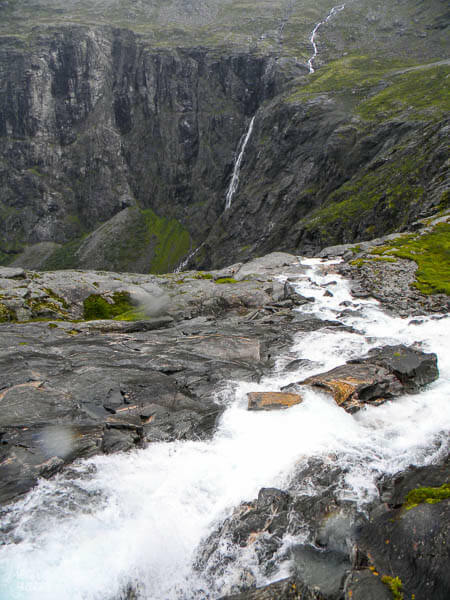 You can see the waterfall snake all the way down the mountain and into the valley. And if you look really closely, you can see cars. The size and scale is brain-melting. 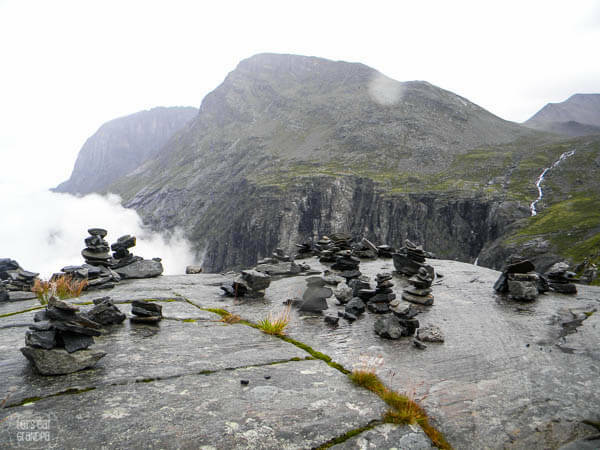 It was hard to leave Trollstigen, but we had another sight to check out: Gudbrandsjuvet. 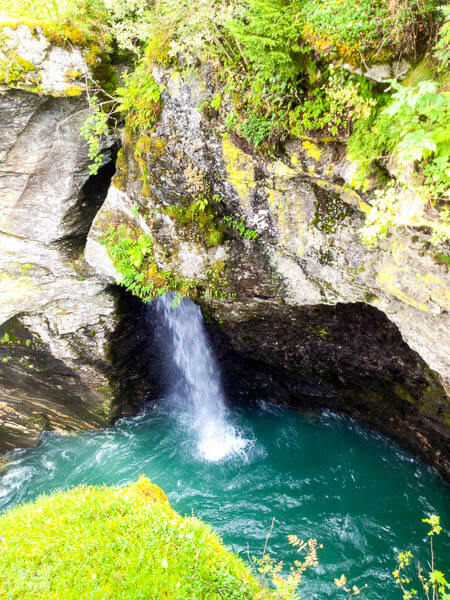 This roughly translates to “holy crap waterfalls!! 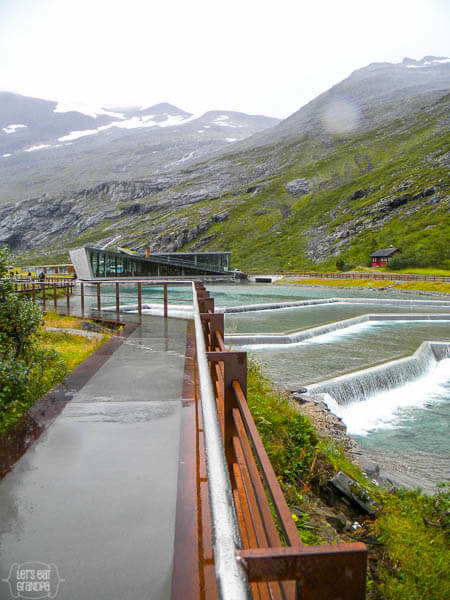 !” It’s just a little park off the side of the road a few miles away from Trollstigen, but it’s an incredible little stop — both for the waterfalls and river, as well as the architecture of the visitor’s center (“Norway: We Have Awesome Visitors’ Centers”). I swear, California would charge you a pretty penny to see this, but it was totally free in Norway. 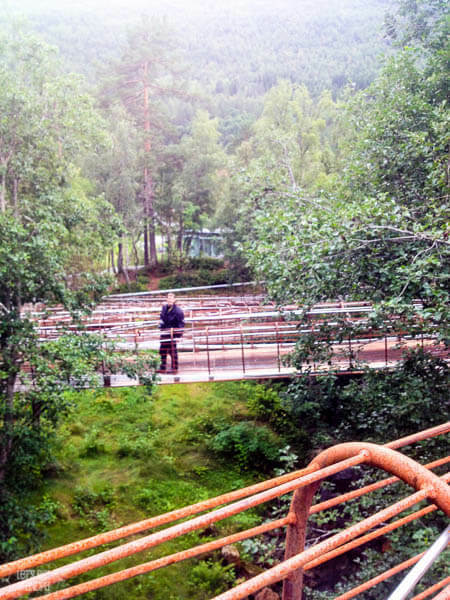 There were a bunch of metal walkways out to the waterfall — such a cool way to walk through the woods. The drive back to Geiranger was just as beautiful as any other part of our drive, and coming in the opposite side of the fjord gave us a new perspective. 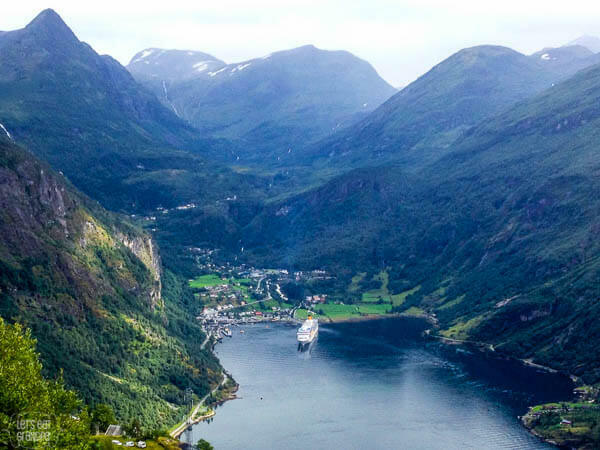 That’s a full-size cruise ship down there, to give you a bit of perspective. What is that you say? Holy crap? Yes, you are correct. 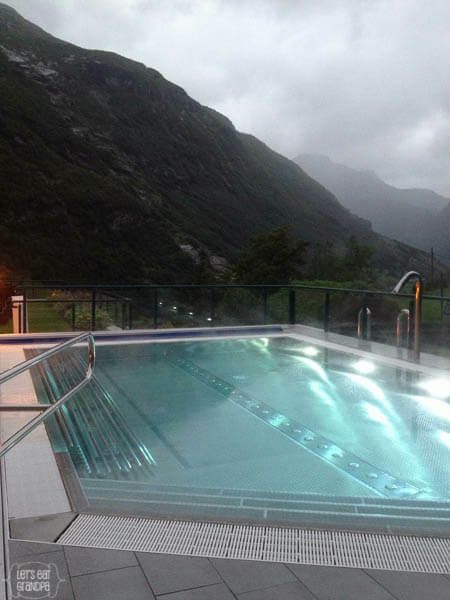 This was our big and fancy night — we splurged and stayed at the Hotel Union in Geiranger. Despite our great day, I had a bit of a downer when I realized I’d left my running shoes in Kristiansund — we had a big hike in a few days, and I knew my sandals and motorcycle boots weren’t going to cut it. 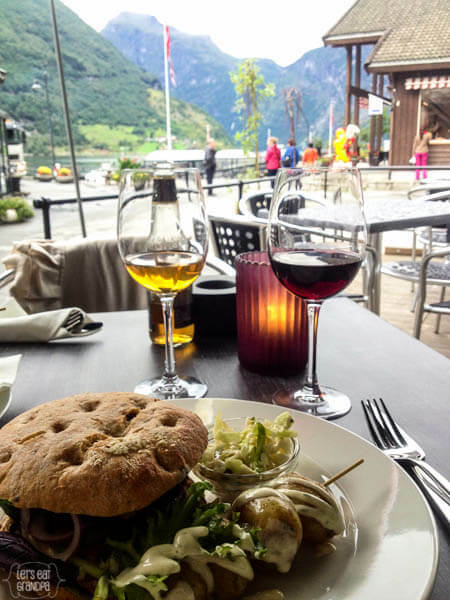 So we hit Geiranger in search of shoes, and had delicious dinner in the process. One thing European restaurants do that everywhere else should do as well? Blankets at all the outside tables. We were able to enjoy the fjord views and stay warm! Seriously, this spa was rad. It had a bunch of buttons and performed like a circus animal — tiny bubbles from the floor, big bubbles under the seat, a giant waterfall, lights, steam, mist, squirting jets — it was the most gadgety spa I’d ever been in. Ryan loved it. (I did too!) We basked in the warm water as the sun set and it started to sprinkle. 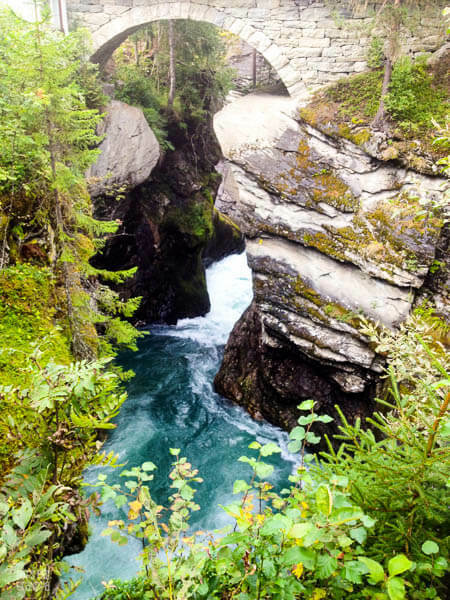 Highly romantic, for all you lovebirds looking for a travel destination! 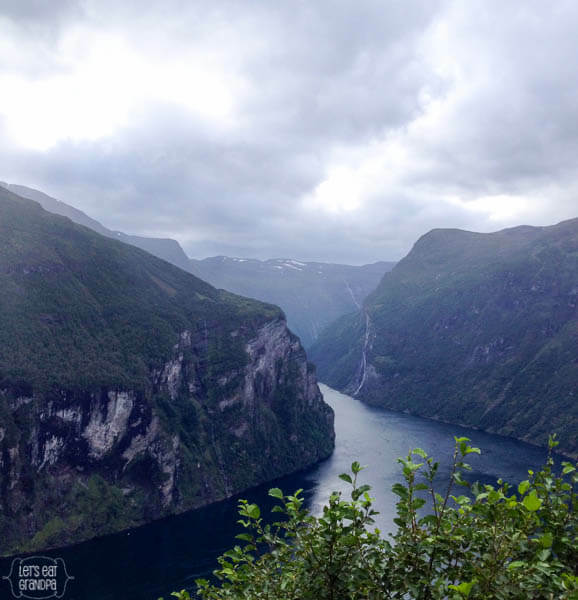 I could have stayed in Geiranger forever, but there was more Norway to see! 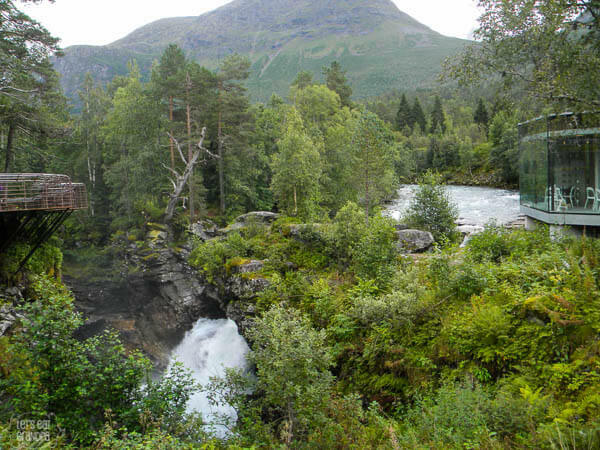 We headed to Hafslo the next day! 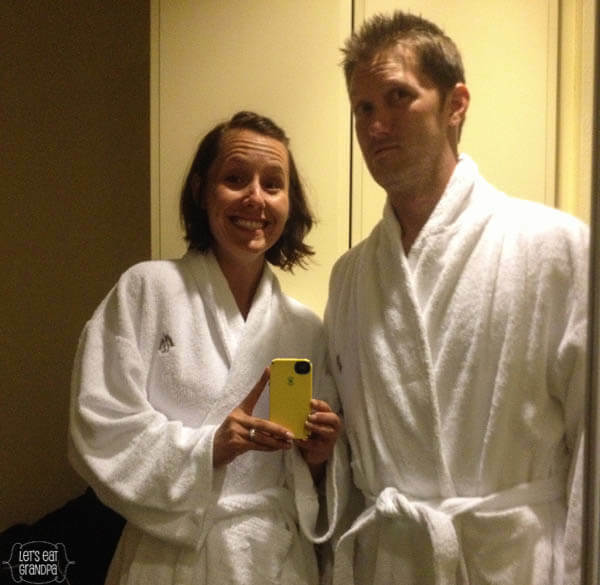 In the next installment of our honeymoon travelogue: Cori and Ryan find out what happens when a tunnel catches fire.